Contrary to what most people think, a furnace and a boiler are not the same thing. This article takes a closer look at how these important household pieces of equipment are different from each other. 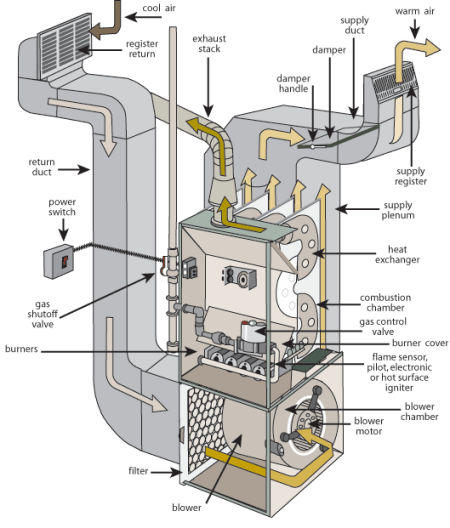 In the US, a furnace, (also called a “forced air furnace”) commonly refers to a household appliance used for providing heat inside the home. A conventional furnace can use several fuel sources such as natural gas, liquefied petroleum gas, and fuel oil. The most popular fuel source in North America and the majority of European homes is natural gas. However, there are rare instances where coal or wood are still used as fuel. Most modern home furnaces are controlled by a thermostat. The thermostat sends a low-voltage signal to a relay in the furnace when the room temperature drops below a preset level. A fuel source such as natural gas is sent to the burners while the blower is turned on. The burner in the combustion chamber is fired up, igniting the gas which produces the heat in the heat exchanger. Warm air coming from the heat exchanger then goes via the home’s duct system and out into the room. Once the desired room temperature is reached, the thermostat sends another signal to the furnace to stop or go on standby to maintain the right amount of heat in the room. 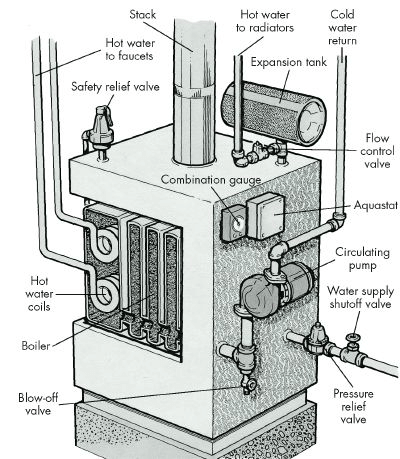 A boiler, or “hydronic hot water system,” is equipment used for heating water or other liquids. It is a “closed vessel” in which heated water or steam is generated and subsequently delivered. This is accomplished with the help of energy released from the combustion of fuels, electricity, and even nuclear energy. The vaporized or heated fluid goes out the boiler and is used in water heating, cooking, power generation, and even sanitation. Boilers can be activated manually or with electronic timers that can be set to switch the boiler on and off at the desired time. A thermostat may also be used to automatically turn the boiler on when it is cold and then off when the room temperature is warm enough. There are many kinds of boilers, but they all operate on the same principle of heating liquid to deliver heat. When an electronic signal is sent to the boiler to start working, a gas valve (in the case of natural gas or LPG) opens and mixes the fuel with air in the burner for combustion. Heat then goes up the heat exchanger that contains the water. The heated water is moved by circulation pumps through hot water cylinders, under-floor systems, or radiators inside the home. So, what’s the difference between a furnace and a boiler? While they share many similarities, they differ in one crucial aspect. A furnace circulates heated air around the home, while a boiler heats up water and circulates it. A furnace makes use of duct systems to distribute heated air, whereas a boiler typically uses hot water pipes, radiators, or baseboards to move heated water. Furnaces can create a drafty environment that may even cause the spread allergens in the air. In contrast, boilers do not dry out the air or spread allergens.